Missy Raines has developed an indispensible library of online bluegrass bass lessons. Students have access to the interactive bass course which includes backing tracks, tabs, and study materials. Learn to play bluegrass music from a master of the genre. What ultimately sets these bluegrass bass lessons apart from other offerings is the ability to submit a video for review using the ArtistWorks Video Exchange Learning® platform. Missy reviews each submission and records a video response, offering specific guidance to take your bass playing to the next level. All students can access the Video Exchange library and watch each other’s interactions with Missy. This library is constantly expanding and may contain the key to unlock your playing. 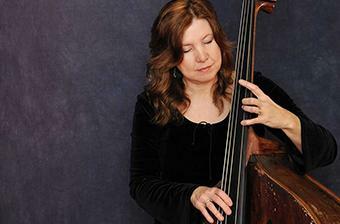 Missy Raines is the most decorated bass player in the history of the International Bluegrass Music Association. A First Lady of Bluegrass, she is one of the most popular bluegrass figures and a trailblazer in her field. Missy has toured and performed extensively all over the world for the last 25 years and has given bass lessons at dozens of workshops and music camps. Her rich pedigree reaches from legends such as Mac Wiseman, Kenny Baker and Eddie Adcock to contemporary artists like Peter Rowan, Laurie Lewis and Don Rigsby. Missy plays with her own band, The New Hip, bridging the genres of newgrass and jazz in the spirit of David Grisman. Missy has been a teacher with ArtistWorks since 2011. Right Hand Exercise 1: Developing Alternating Finger Strength and the "Follow Thru"
How to Play in Waltz or 3/4 Time "Rank Stranger"
"Inside Out" Double Stops and "Drop Thumb"